Apple dimpling bug (Campylomma liebknechti) adults feed on developing fruitlets of apples, pears, nashi pears and occasionally summerfruit (stone fruit) resulting in distortion that makes fruit unsaleable. Regular monitoring is critical to avoid major crop loss. This page explains how to identify, monitor and manage this insect. Adults of apple dimpling bug invade deciduous fruit tree orchards in spring. 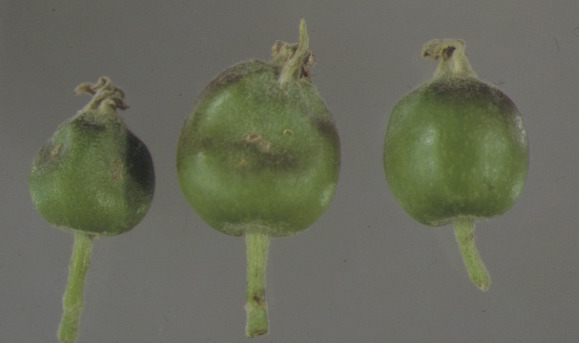 They feed on the flowers and immature fruitlets, causing cell damage that results in scarring and dimpling of the fruit as it expands, rendering fruit unmarketable. Apple dimpling bug or dimple bug is native to Australia, and common on many native and introduced flowering plants including wattle, tagasaste (tree lucerne) and Geraldton wax. Adults are small, greenish-brown insects about 3mm long. Females are pale green and have a needle like ovipositor to insert eggs into plant tissue. Males are pale brown. To the naked eye they are similar to small native flies and leaf hoppers, and without correct identification, unnecessary spraying may occur. Dimple bugs can be identified with the aid of a 10x hand lens. They have spiny legs, a triangular shape formed by the wing covers and dark bands at the base of the antennae. Another reliable distinguishing characteristic is the distinctive sweet smell emitted when a bug is squashed. They also tend to avoid direct light. By squashing and smelling any insects found hiding under flower petals in a sampling container, dimple bugs will be identified correctly. Plague thrips may also be seen during monitoring for dimple bugs and their abundance can be assessed at the same time. Plague thrips can cause heavy apple crop losses if present in very high numbers at flowering. Spray treatments for dimple bug may also have some effect on thrips numbers and this is indicated in table 1. Flower tapping into a light-coloured container such as a white plastic ice-cream tub is a simple and effective monitoring method. Start by sampling native trees such as wattle just prior to apple flowering to get an early estimate of the numbers of dimple bug in the vicinity of the orchard. 1. Start monitoring apple trees at pink bud stage and continue twice weekly until petal fall. 2. Monitor in the cool of morning - before 9.00am. The bugs become too active for accurate identification and counting when it is warm. 3. Dimple bugs enter the orchard from the bush, so trees nearest the bush should be included in the monitoring. 4. Dimple bugs are in greater numbers on the sunny sides of trees. 5. Tap four flower clusters on the sunny side of each tree over a container. · Include a minimum of 25 trees per hectare, to total 100 flower clusters. · Monitor across blocks to get a representative estimate of the presence of the pest. 6. Record the numbers of dimple bugs found and determine whether a spray is required. 7. If the cover crop is flowering, mow the orchard before spraying to reduce bee fatalities. 8. Continue monitoring after spraying – re-invasion from the bush is likely. Monitoring after spraying will also help determine whether spraying has been effective. Poor monitoring can result in an under estimation of dimple bug numbers which may lead to increased levels of damage. Spray when two or more bugs per 100 flower clusters are found for 25 trees checked. Consult the APVMA (Agricultural Pestsicides and Veterinary Medicines Authority) website or InfoPest for more details on registered insecticides for control of apple dimpling bug. Toxic to bees – apply no later than pink bud – mow cover crop if flowering to reduce bee fatalities. Moderately harmful to predatory mites. Not recommended for thrips control. Toxic to bees – apply no later than pink bud – mow cover crop if flowering to reduce bee fatalities. Not recommended for thrips control. Low hazard to bees but will kill predatory mites. Do not apply after 20% of blossoms have opened. Apply no more than two non-consecutive sprays per season. Good control of plague thrips. Spray late afternoon only – will kill predatory mites – apply only once per season. Good control of plague thrips. Spray only when bees are not foraging – will kill predatory mites. Good control of plague thrips. Safe on bees and predatory mites. Registered for apples only. Spray with dilute spray equipment only. A substantial reduction in dimple bug numbers may not be evident after spraying, though the bugs should appear sluggish. Good control of plague thrips. acetamiprid and novaluron Cormoran® Toxic to beneficial arthropods. Dangerous to bees and residues could remain toxic to foraging bees for several days after spraying. Registered for control of plague thrips. Product names are examples only and other products may be registered for use. Always read the label before using any pesticide. If you intend to export apples, confirm with Apple and Pear Australia Limited whether the intended chemical can be used so that your fruit will meet import requirements for each country. Note: Mention of trade names does not imply endorsement of preference of any company’s product by the Department of Primary Industries and Regional Development, Western Australia, and any omission of a trade name is unintentional. Recommendations were current at the time of preparation of this information.